I was surprised about the quality. Pro 1; great lens, shoots fast, great zoom, IS works perfectly, screen probably best - even if sunny you still see the taken picture. 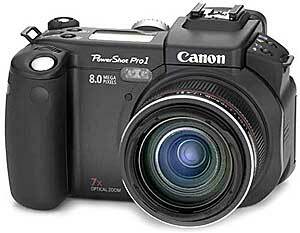 The Canon PowerShot Pro 1 was released in early 2004. One of it's unique selling points was that it has a ring around the lens barrel that controlled the zoom, rather than a zoom lever. This mimicked a proper zoom found on mechanically linked zoom lenses. It also had a neat fold-out-and-flip LCD display. Very handy for taking pictures above peoples' heads in crowds.